Side view of the Moltke crater taken from Apollo 11. The word crater was adopted by Galileo from the Greek word for vessel - (Κρατήρ a Greek vessel used to mix wine and water). Galileo built his first telescope in late 1609, and turned it to the Moon for the first time on November 30, 1609. He discovered that, contrary to general opinion at that time, the Moon was not a perfect sphere, but had both mountains and cup-like depressions, the latter of which he gave the name craters. 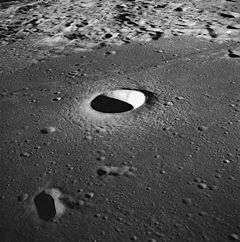 The formation of new craters is studied in the lunar impact monitoring program at NASA. The biggest recorded creation was caused by an impact recorded on March 17, 2013. The explosion, which was visible with the naked eye, is believed to be from an approximately 40 kg meteoroid hitting the moon with a speed of 90000 km/h. 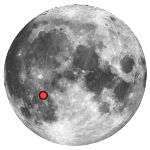 Because of the Moon's lack of water, and atmosphere, or tectonic plates, there is little erosion, and craters are found that exceed two billion years in age. 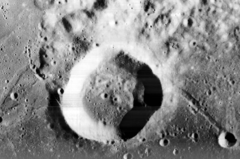 The age of large craters is determined by the number of smaller craters contained within it, older craters generally accumulating more small, contained craters. Beginning in 2009 Dr. Nadine Barlow of Northern Arizona University began to convert the Wood and Andersson lunar impact-crater database into digital format. Dr. Barlow is also creating a new lunar impact crater database similar to Wood and Andersson's, except hers will include all impact craters greater than or equal to five kilometers in diameter and is based on Clementine (spacecraft) images of the lunar surface. 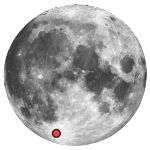 The moon zoo project within the Zooniverse program aims to use citizen scientists to map the size and shape of as many craters as possible using data from the NASA Lunar Reconnaissance Orbiter. 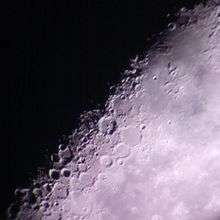 Craters constitute 95% of all named lunar features. Usually they are named after deceased scientists and other explorers. This tradition comes from Giovanni Battista Riccioli, who started it in 1651. Since 1919, assignment of these names is regulated by International Astronomical Union. Majority of named lunar craters are satellite craters: their names consist of the name of nearby named crater and a capital letter (for example, Copernicus A, Copernicus B, Copernicus C and so on). Lunar crater chains are usually named after nearby crater. Their Latin names contain the word Catena ("chain"). For example, Catena Davy is situated near crater Davy. 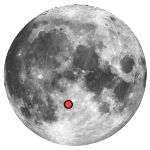 ↑ This term was coined by Soviet explorers of the Moon after beginning of exploration of lunar farside. Later, in 1967, on XIII General Assembly of the International Astronomical Union this word was proposed to be included into the list of generic terms of nomenclature of lunar surface features, but this proposal was declined. So, this term remains only a characterization of the features, but not a part of their names. ↑ Pike, RJ (1977). "Size-dependence in the shape of fresh impact craters on the moon". 1: 489–509. ↑ Quaide, W.L. & Oberbeck, V.R. (1968). "Thickness determinations of the lunar surface layer from lunar impact craters". Journal of Geophysical Research. American Geophysical Union. 73 (16): 5247–5270. Bibcode:1968JGR....73.5247Q. doi:10.1029/JB073i016p05247. ↑ "Lunar Impacts". Marshall Space Flight Center. Retrieved 2013-05-18. ↑ Wood C. A.; Anderson L. (1978). "New morphometric data for fresh lunar craters" (PDF). Proceedings of the 9th Lunar and Planetary Science Conference, Houston, Texas, March 13–17, 1978: 3669–3689. Bibcode:1978LPSC....9.3669W. ↑ "Proceedings of the Thirteenth General Assembly (Prague, 1967) – excerpts". The-Moon Wiki. Archived from the original on 2013-09-25. Retrieved 2014-09-01. ↑ J. A. Jackson; J. P. Mehl; K. K. E. Neuendorf (American Geological Institute), eds. (2005). Glossary of Geology (5th ed.). Springer Science & Business Media. p. 665. ISBN 978-0-922-15276-6. ↑ Mosher J. (1970). Lunar Farside Cratering (submitted in partial fulfilment of the requirements for the degree of bachelor of science) (PDF). Massachusetts Institute of Technology. p. 10. ↑ David T. W. Buckingham; Bitha Salimkumar & Nadine G. Barlow (2011). "Development of a New GIS Database of Lunar Impact Craters" (PDF). 42: 1428. 1 2 "Categories for Naming Features on Planets and Satellites". Gazetteer of Planetary Nomenclature. International Astronomical Union (IAU) Working Group for Planetary System Nomenclature (WGPSN). Archived from the original on 2014-08-10. Retrieved 2014-08-24. 1 2 Greeley R.; Batson R. M. (1990). "4.2. Moon: 1640–1977". Planetary Mapping. Cambridge University Press. pp. 97–103. ISBN 978-0-5210-3373-2. ↑ "Descriptor Terms (Feature Types)". Gazetteer of Planetary Nomenclature. International Astronomical Union (IAU) Working Group for Planetary System Nomenclature (WGPSN). Archived from the original on 2013-12-10. Retrieved 2014-08-24.